Shawn Tillerman thinks he’s losing his mind. Wary and damaged after a hard life filled with broken promises, he’s been having dissociative episodes for the past few months. Flashes of different lives he didn’t live. Walking in the footsteps of men he knows he never was. In these waking dreams, he’s always with a lover, but he can’t see the man’s face and doesn’t know his name. Though the episodes are becoming more frequent, he hasn’t told anyone what’s happening to him. He’s too busy taking care of his twin sister and keeping her away from Oxy. If he can sell the house he’s inherited from a distant relative, he’ll finally have enough money to put her in a good rehab center. He can turn their lives around. Or not. Because Raleigh, the compelling stranger who wants to buy their house, swears that Shawn isn’t experiencing psychotic episodes, but is reliving memories. That he and Shawn have come together in life after life and time after time. That he is the man from Shawn’s dreams, and has been searching everywhere for him. Even if Shawn remembers nothing, Raleigh remembers it all, and he isn’t going to give up now. Shawn doesn’t believe Raleigh–but he’s beginning to wish he could. What if it is true, after all? What if saying goodbye to all he thought he was sure of is only the first part of hello? I’ve always enjoyed stories about people who meet time after time in different lives. It might have to do with this idea I have that every person we meet is here for a very specific reason, and that a goodbye is never really a good bye. I find the whole thing comforting, and it brings certain kind of peace in knowing that no matter how much it hurts to lose someone in this life, there is always the next. Am I weird? Eh, maybe. This story was comforting like that. Shawn inherited a house from a long distance relative. Since his and his sister’s situation isn¡t easy, and hasn’t been easy for a very long time, he decides to sell the house, get the money and help his sister with a problem she’s been having for quite a while now. Turns out that the person who is to buy the house is Raleigh. When they meet, Raleigh immediately recognizes Shawn, but Shawn has no clue of who Raleigh is or what a big piece he’s been in his past lives. It’s Raleigh’s job to make Shawn remember, somehow. Their love story is sweet, and I think I could even say rather powerful? All through the book we see bits of their past lives together, and it was lovely to read… However… The way the memories (let’s call them that) were thrown in there was a bit confusing to me. There is no change in the font, or there is but only in a few of those memories, so in the beginning I did get lost, like, very, very lost. I wasn’t sure what I was reading or what was happening. Aside from that I really found this to be an enjoyable read. There is the fact that we have different secondary characters that are somehow connected to the main characters, and have been for literally ages. The idea of recognizing your soul mate was awfully romantic, and I liked it a lot. 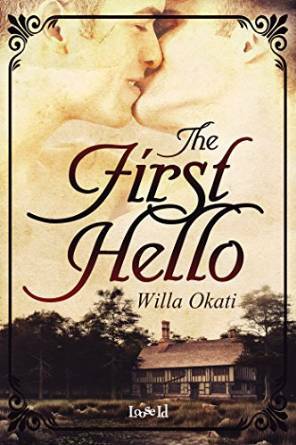 This entry was posted on June 11, 2015 by Gaby in PNR / UF / SF / DYS, Reviewer: Gaby and tagged 3 Stars, loose-id, M/M, Past Lives, Reincarnation, Willa Okati.